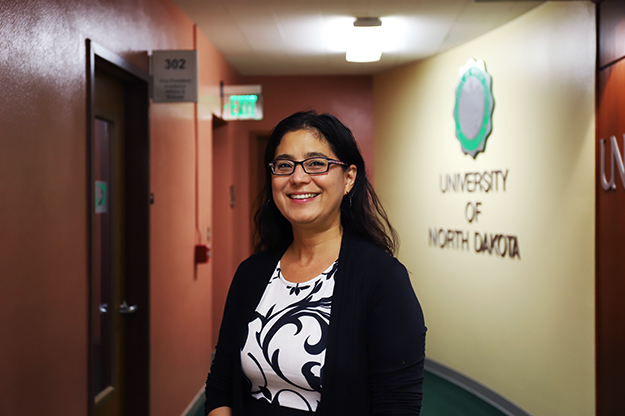 In her new role as senior vice provost, Debbie Storrs, formerly dean of the UND College of Arts & Sciences, aims to improve student success and retention while helping students avoid the pitfalls she had as a first-generation college student. Photo by Connor Murphy/UND Today. Debbie Storrs is connecting the dots for student academic success. In her new role as senior vice provost, Storrs oversees the elements of student academic services, recruitment, retention and support. Storrs is responsible for leading and collaborating with directors and staff in student academic services, Essential Studies, the honors program, ROTC, International Programs, Strategic Enrollment Management, the registrar’s office, assessment and accreditation, and the Teaching Transformation & Development Academy (TTaDA). Even though she’s left the College of Arts & Sciences, Storrs will still focus on the value of the liberal arts as captain for Goal 1, strong liberal arts foundation, of the One UND Strategic Plan. Storrs said her goal is to improve student success and retention by connecting, strengthening, and supporting academic student services and programs. And she wants to create opportunities while helping students avoid the pitfalls she had as a first-generation college student. Storrs, like many students, floundered a little when she went to school, and ended up dropping out to work as a transcriptionist for several years. She knew she needed to go back to school, but didn’t have a major. Then she remembered one of her favorite classes. “I went back to school to major in sociology because I loved an introductory class by Professor Jack Peterson at the University of Alaska,” she said. “The class provided a new lens to the world. 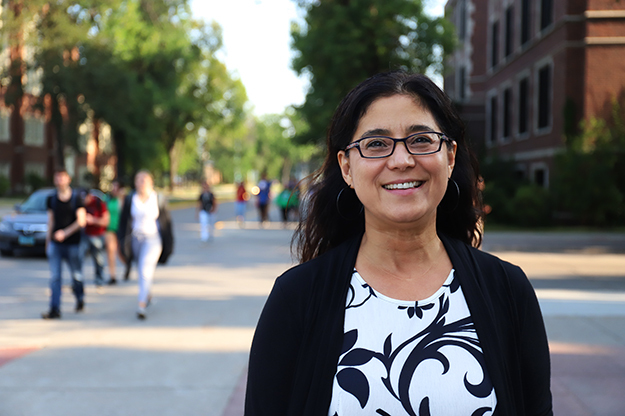 The class inspired me to think differently about the world.” Another faculty mentor involved Storrs in research as a work study student, which led her to consider graduate school and ultimately to earn a master’s and doctoral degree in sociology from the University of Oregon. As a graduate student, she served as a teaching assistant for historian Quintard Taylor, who was known for his teaching prowess. Storrs earned multiple teaching, advising and other awards at the University of Idaho, and this fall will team-teach an Introduction to University Life class for first-generation students. “I’m excited to return to the classroom and connect with students,” Storrs said. As the captain of UND’s Strategic Plan Goal No. 1 — a strong liberal arts foundation — Storrs is looking to the future and watching changes in higher education across the nation and in North Dakota. Photo by Connor Murphy/UND Today. As the captain of Strategic Plan Goal No. 1, a strong liberal arts foundation, Storrs is looking to the future and watching changes in higher education – both across the nation and in North Dakota. Storrs noted that colleges and universities which fail to respond to today’s students are consolidating, closing or realigning their missions.